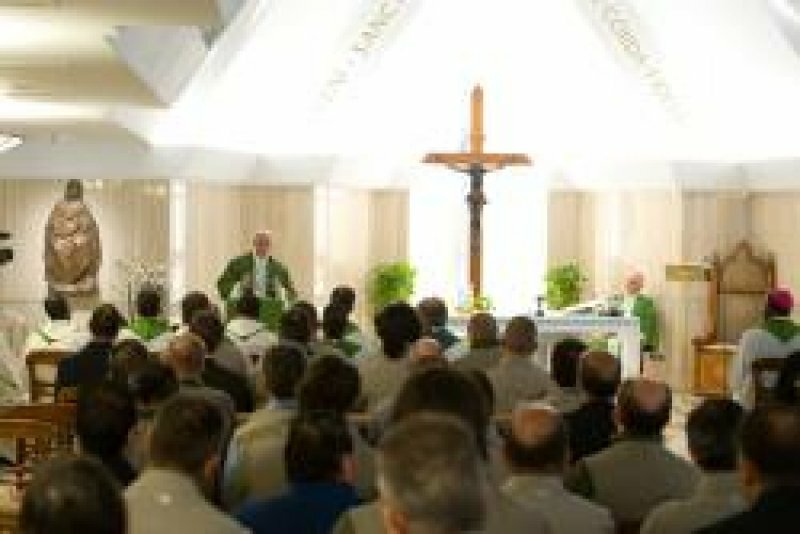 VATICAN Pope: we must pray with courage, persistence, become "tiring": praying is also "negotiating with the Lord"
During Mass at the Casa Santa Marta, Francis gives the example of Abraham who tries to save Sodom from destruction. "If you want that the Lord to grant a grace, you must boldly go and do what Abraham did, with the same insistence." Jesus himself tells us that we should pray like the widow with the judge, like the one who goes at night to knock on the door of his friend. With insistence: "Jesus teaches us that." Vatican City (AsiaNews) - We must pray with courage, persistence, become "tiring" praying is also "negotiating with the Lord", it is "possible only when there is familiarity" with Him 'as stated this morning by Pope Francis at Mass celebrated in the Casa Santa Marta, commenting on the biblical passage of Abraham's attempt to save Sodom from destruction. "Abraham - said the Pope, according to Vatican Radio - is bold and prays with courage", "he feels the strength to speak face to face with the Lord and seeks to defend that city." And he does so persistently. "When we speak of courage we always think of apostolic courage to go and preach the gospel, these things ... But there is also the courage before the Lord. That pharresia before the Lord: bravely going to the Lord asking for things. It makes us laugh a little, it is funny because Abraham speaks with the Lord in a special way, with courage and so we don't know: it this a man praying or a 'Phoenician trader', because he is haggling over the price... he insists: ... from fifty he was able to lower the price to ten. He knew that was not possible. There was only one righteous man: his nephew, his cousin ... But with courage, with insistence, he pushed ahead. " Sometimes, the Pope said, one goes to the Lord "to ask something for someone;" one asks for a favor and then goes away. "But that," he warned, "is not prayer," because if "you want the Lord to bestow a grace, you have to go with courage and do what Abraham did, with that sort of tenacity." The Pope recalled that Jesus himself tells us that we must pray as the widow with the judge, like the man who goes in the middle of the night to knock on his friend's door. With tenacity. In fact, he observed, Jesus himself praised the woman who tenaciously begged for the healing of her daughter. Tenacity, said the Pope, even though it's tiring, is really "tiresome." But this, he added, "is the attitude of prayer." Saint Teresa, he recalled, "speaks of prayer as negotiating with the Lord" and this "is possible only when there's familiarity with the Lord." It is tiring, it's true, he repeated, but "this is prayer, this is receiving a grace from God." The Pope stressed here the same sort of reasoning that Abraham uses in his prayer: "take up the arguments, the motivations of Jesus' own heart." "To convince the Lord with the Lord's own virtues! That is beautiful! Abraham's appeal goes to the heart of the Lord and Jesus teaches us the same: 'the Father knows things. The Father - don't worry - sends rain down on the just and the sinners, the sun for the just and for the sinners.' With that argumentation, Abraham forges ahead. I will stop here: praying is negotiating with the Lord, even becoming inappropriate with the Lord. Praying is praising the Lord in the beautiful things he shares and telling him that he bestow these beautiful things on us. And (appealing to him) who is so merciful, so good, to help us!" "I would like for all of us to take five minutes, no more today to take up the Bible and slowly read Psalm 102", which comes between the two readings: "Bless the LORD, O my soul; and all my being, bless his holy name. Bless the LORD, O my soul, and forget not all his benefits. He pardons all your iniquities, he heals all your ills. He redeems your life from destruction, he crowns you with kindness and compassion.' "Pray all of this psalm and with this we learn the things we must say to the Lord when we request a grace. 'You who are Merciful and forgiving, grant me this grace:' just as Abraham did and as Moses did. We forge ahead in prayer, courageous, and with these motivations which come right from the heart of God himself."